God gave me a Father and Mother more worthy of Heaven than of Earth. ....God Our Father loves us always, absolutely, unfailingly, eternally. How great is the power of prayer! 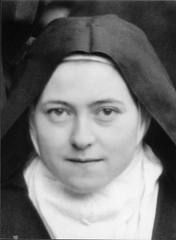 Until my coming to Carmel, I had never fathomed the depths of the treasures hidden in the Holy Face. Jesus does not demand great actions from us but simply surrender and gratitude. I understood that without love all words are nothing. I am not dying; I am entering into life. I feel that my mission is about to begin, my mission to make God loved as I love Him, to teach souls my little way.